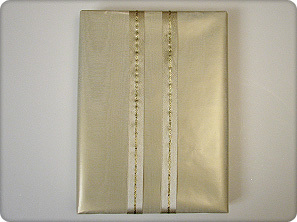 Wrap a box in gold wrapping paper. 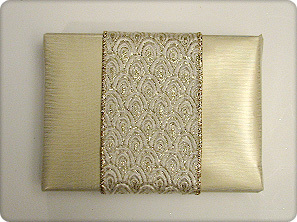 Cut a piece of the 2-1/2 inch wide cream ribbon long enough to wrap around the entire width of the box plus 1 inch. 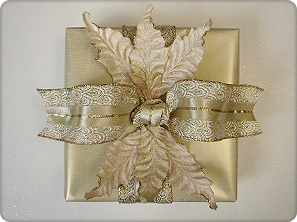 Center the piece of ribbon on the top of the box and glue, overlapping the ends on the bottom of the box. 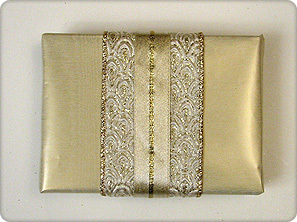 Cut a piece of the 1 inch gold ribbon long enough to wrap around the entire width of the box plus 1 inch. 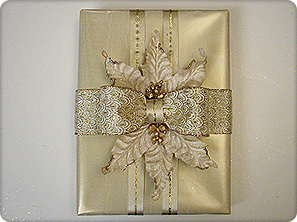 Center the piece of ribbon onto the cream ribbon and glue, overlapping the ends on the bottom of the box. Glue 3 of the petals together at the ends, overlapping each other in a fan shape. Repeat with the other 3 petals. Glue a set of petals onto the center of the box directly onto the ribbon, allowing the petal tips to extend beyond the edge of the box. Repeat on the other side, slightly overlapping the ends of the petals. Glue the gold beads onto the center of the petals where the two sets meet, to hide the seam. Arrange the large beads two across and two down, two small beads beneath the large and then one small bead beneath the two small beads to give them the tapered effect. 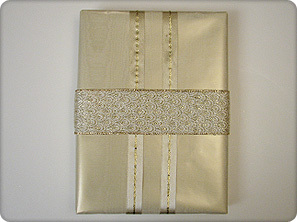 Wrap a box in gold paper. 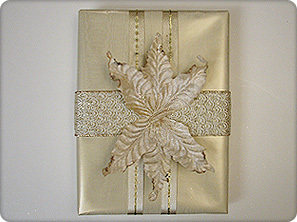 Cut a piece of both 2-1/2 inch cream and 1 inch gold ribbon long enough to wrap around the box 2 times. 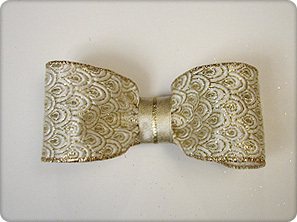 Center the 1 inch gold ribbon onto the cream ribbon and glue. Center the ribbon on the bottom of the box, bring the both sides of the ribbon to the center top of the box and tie in a knot. Trim the ends to matching lengths, cutting them into a V and bending them to form a nice shape. Apply glue to bottom end of a set of petals and attach to the ribbon near the knot, on the side without the tails. Repeat on the other side of the box. Glue the gold beads onto the petals near the knot on each side of the bow. Arrange the large beads two across, two small beads beneath the large and then one small bead beneath the two small beads to give them the tapered effect. 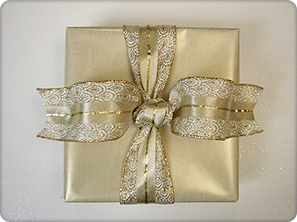 Cut 2 pieces of the 1 inch gold ribbon long enough to wrap around the entire length of the box plus 1 inch. Center the ribbon on the top of the box leaving about in inch in between each ribbon and glue, overlapping the ends on the bottom of the box. 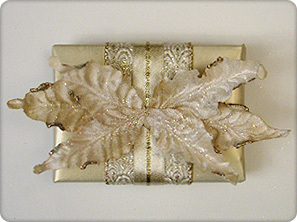 Cut a piece of the 2-1/2 inch cream ribbon long enough to wrap around the entire width of the box plus 1 inch. Center the ribbon on the top width of the box and glue, overlapping the ends on the bottom of the box. 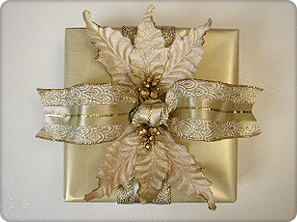 To make the bow, cut a piece of ribbon double the width of the top of the box minus 1 inch. 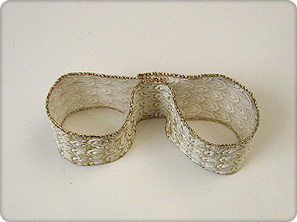 Fold the ends to middle and glue, overlapping about ½ inch to form a loop. Cut a 4 inch piece of the 1 inch wide gold ribbon and place the right side of the double loop face down onto the inside of the gold ribbon piece. Using your fingers, cinch the double loop to make the center smaller. 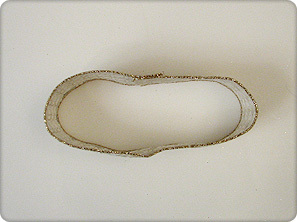 Apply glue to each end of the 4 inch strip and fold over to form a bow. 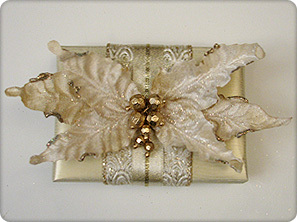 Apply glue to the bottom end of a set of petals and attach to the cream ribbon in the center of the box. Repeat on the other side of the box. Glue the bow onto the center box where the two sets of petals meet to hide the seam. 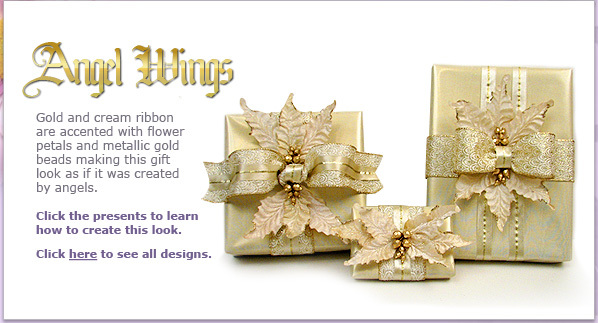 Glue the gold beads onto the petals on each side of the bow. Arrange the large beads two across, two small beads beneath the large and then one small bead beneath the two small beads to give them the tapered effect.